54-year-old female concerned with brow and eyelid aesthetics underwent an endoscopic brow lift and lower eyelid lift (blepharoplasty). She felt that she appeared angry, older and tired because of her forehead and brow depression and shape. She was also concerned with the fine lines, puffiness, and looseness of her lower eyelids. The procedure involved a minimal incision endoscopic brow lift using 3.0 Endotines. In addition, disruption and partial removal of her forehead depressor muscles was performed. 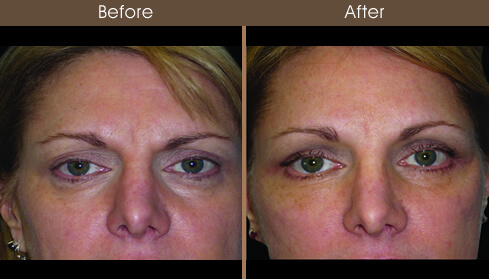 A lower eyelid pinch blepharoplasty was performed to create a more youthful lower eyelid contour.